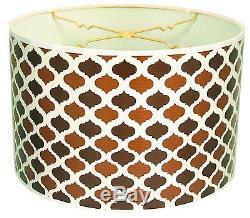 Royal Designs DESIGNERS LAMP SHADE Drum- TWO-TONE BROWN 10x10x7in HBC-8025-10. Is proud to present the exclusive custom made in the USA hardback lamp shade. We have utilized world class designers and artists to be a part of the design of these one-of-a-kind lampshades. This custom made in the USA designer hardback shade is the perfect conversational piece that comes in a variety of sizes. All the custom designed made-to-order lampshades may take longer than our in-stock lampshade to deliver due to the nature of the product. Note: This is a Special Order Item and will take approximately 2 weeks to order. Shade Dimensions: 10 x 10 x 7. Washer: standard (0.5 inch recess) brass-finish spider fitterwithtrademark stamping. (Shades with 9"+ top diameter have a v-notch fitter for use with a 6" or 8 reflector bowl). Frame: heavy Grade rust resistant metal Frame. Thicker than typical standard lamp Shades. Royal Designs LAMP SHADE Shallow Drum. Indoor use only, General purpose. Brand Name: Royal Designs Inc. Photos are for illustrative purpose only. Express Post is an optional extra. In most circumstances direct contact between yourself and Australia Post will result in the most efficient resolution. The item "Royal Designs DESIGNERS LAMP SHADE Drum Finial Fitting TWO-TONE BROWN 10 / 25cm" is in sale since Friday, April 07, 2017. This item is in the category "Home & Garden\Lighting, Fans\Lamp Shades".